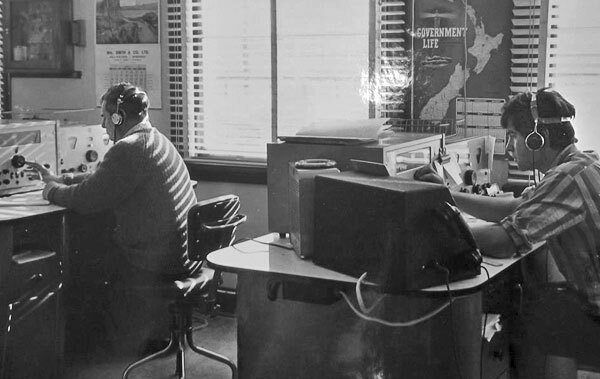 During the 1960s, Radio New Zealand recorded an interview with five men associated with Awarua Radio as they talked about the station’s history. Unfortunately only one voice has been identified, so if you can help us identify the others, we’d love to hear from you. Or, you might enjoy hearing some Awarua history. 1961: Ceased copying London Press Service (formerly known as British Official Wireless Press). 1963: Doubtful Sound – Awarua circuit opened. 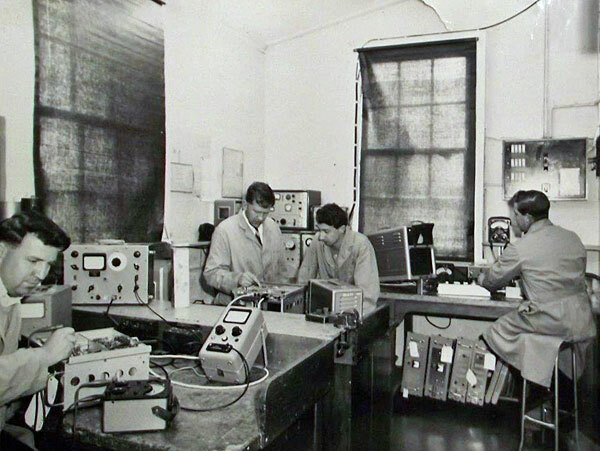 1964: Telefunken MF direction finding sets installed but were ineffective and later dismantled. Main MF DF service discontinued and dismantled. 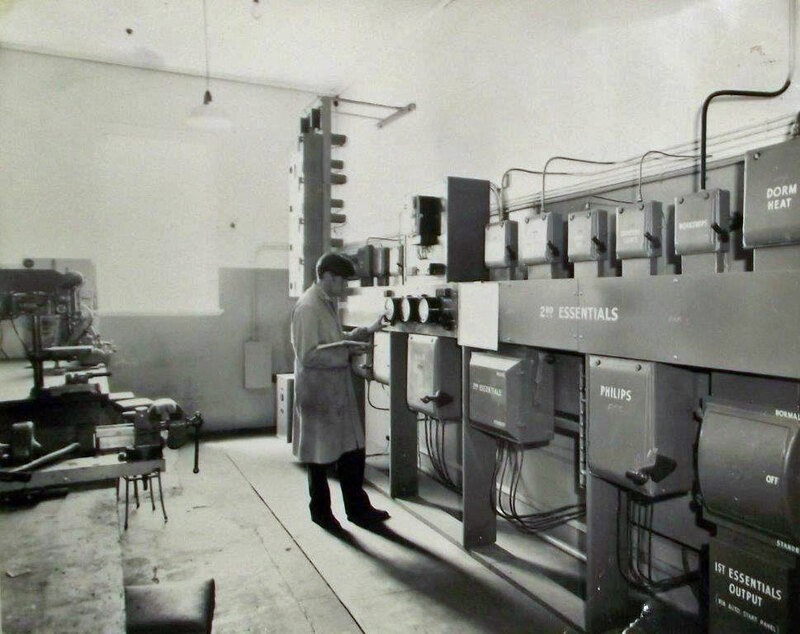 Three Junior Mechanicians – Dale Spittle, Noel Blair and Bob Walker – start at ZLB. 1965: HF 22 Mc/s listening watch commenced 8am-6pm. Superintendent JU Bonisch died and was replaced by JB Dolan. 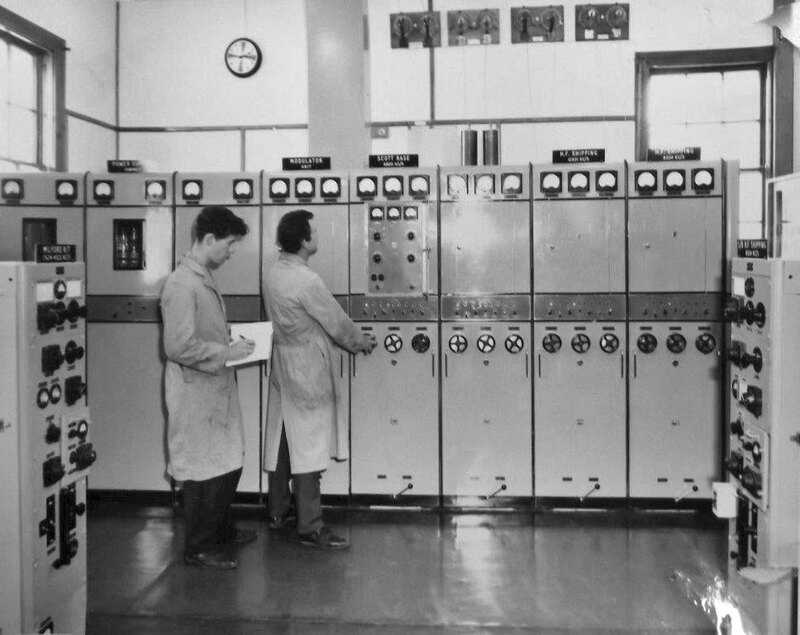 Junior mechanician Dale Spittle taking meter readings on the switching and control panel in the power room, c1966. Photo courtesy Alex Glennie. Click to enlarge. 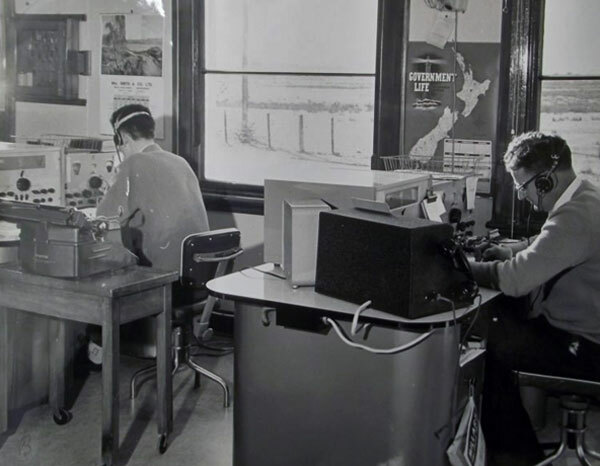 Bob Walker thinks that this photo from Awarua Radio c1966 shows Ross Luscombe on the left and Senior Tech Boyd Brown taking meter readings on a Phillips transmitter. Click to enlarge. 1967: Scott Base circuit to Awarua was closed and opened direct to Wellington. JR Bell retired. 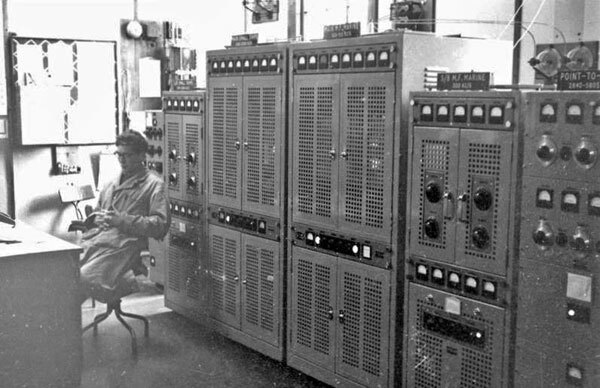 Creed teleprinter circuit between coast stations in operation. Emergency stations to be converted to SSB (single sideband). In March, fire gutted the Awarua Radio hostel. In August, the Southland News ran a small photo feature about the station. On 1 October, the Awarua North railway stop, just outside the entrance to Awarua Radio, was decommissioned. 1968: NC Pawley retired. Continuous headphone watch on 2182 kc/s introduced. Awarua’s transmitting frequencies changed on 8 Mc/s to 8504 kc/s and on 12 Mc/s to 12,740 kc/s. Awarua copies weak emergency message from TSS Gothic which had been damaged by fire at sea with the loss of seven lives. 1969: HF DF No. 2 now property of NZPO. 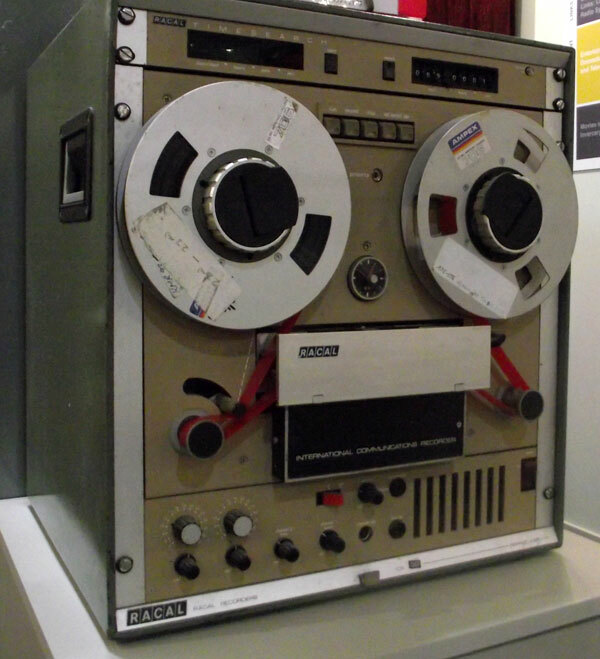 Tape recorders installed and being run continuously on 2182 kc/s. New Zealand and Australia withdraw from area scheme on 1st October 1969. Staff establishment 28 10/40. New Collins 51S-1 receivers installed for 2182 kc/s to enable SSB working. 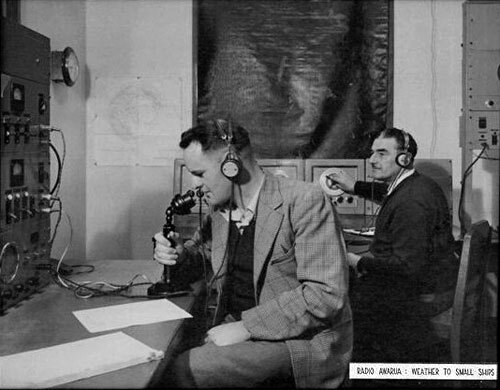 PJ Columb (at that time Superintendent of Auckland Radio ZLD) died. December traffic increase of 30% noted.